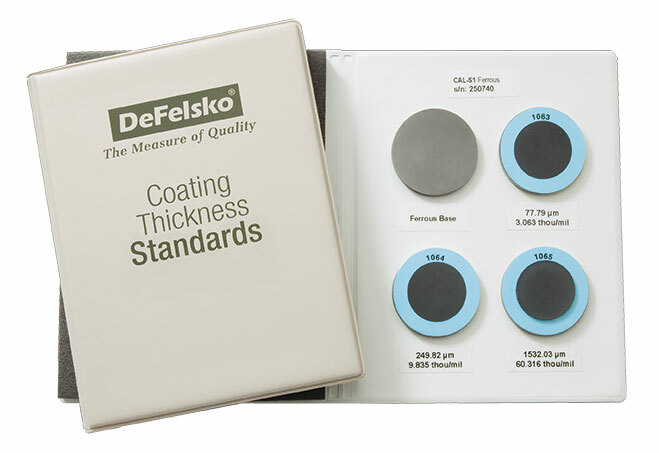 Coating thickness is an important variable that plays a role in product quality, process control, and cost control. Measurement of film thickness can be done with many different instruments. Understanding the equipment that is available for film thickness measurement and how to use it is useful to every coating operation. The issues that determine what method is best for a given coating measurement include the type of coating, the substrate material, the thickness range of the coating, the size and shape of the part, and the cost of the equipment. Commonly used measuring techniques for cured organic films include nondestructive dry film methods such as magnetic, eddy current, ultrasonic, or micrometer measurement and also destructive dry film methods such as cross-sectioning or gravimetric (mass) measurement. Methods are also available for powder and liquid coatings to measure the film before it is cured. Magnetic film gages are used to nondestructively measure the thickness of a nonmagnetic coating on ferrous substrates. Most coatings on steel and iron are measured this way. Magnetic gages use one of two principles of operation: magnetic pull-off or magnetic/electromagnetic induction. Magnetic pull-off gages use a permanent magnet, a calibrated spring, and a graduated scale. The attraction between the magnet and magnetic steel pulls the two together. As the coating thickness separating the two increases, it becomes easier to pull the magnet away. Coating thickness is determined by measuring this pull-off force. Thinner coatings will have stronger magnetic attraction while thicker films will have comparatively less magnetic attraction. Testing with magnetic gages is sensitive to surface roughness, curvature, substrate thickness, and the make up of the metal alloy. Magnetic pull-off gages are rugged, simple, inexpensive, portable, and usually do not require any calibration adjustment. They are a good, low-cost alternative in situations where quality goals require only a few readings during production. Pull-off gages are typically pencil-type or rollback dial models. Pencil-type models (PosiPen shown in Fig 1) use a magnet that is mounted to a helical spring that works perpendicularly to the coated surface. Most pencil-type pull-off gages have large magnets and are designed to work in only one or two positions, which partially compensate for gravity. A more accurate version is available, which has a tiny, precise magnet to measure on small, hot, or hard-to-reach surfaces. A triple indicator ensures accurate measurements when the gage is pointed down, up, or horizontally with a tolerance of ±10%. Fig. 1. Pencil-type magnetic pull-off thickness gauge. Rollback dial models (PosiTest shown in Fig 2) are the most common form of magnetic pull-off gage. A magnet is attached to one end of a pivoting balanced arm and connected to a calibrated hairspring. By rotating the dial with a finger, the spring increases the force on the magnet and pulls it from the surface. These gages are easy to use and have a balanced arm that allows them to work in any position, independent of gravity. They are safe in explosive environments and are commonly used by painting contractors and small powder coating operations. Typical tolerance is ±5%. Fig. 2. Roll-back dial magnetic pull-off thickness gauge. Magnetic induction instruments use a permanent magnet as the source of the magnetic field. A Hall-effect generator or magneto-resistor is used to sense the magnetic flux density at a pole of the magnet. Electromagnetic induction instruments use an alternating magnetic field. A soft, ferromagnetic rod wound with a coil of fine wire is used to produce a magnetic field. A second coil of wire is used to detect changes in magnetic flux. These electronic instruments measure the change in magnetic flux density at the surface of a magnetic probe as it nears a steel surface. The magnitude of the flux density at the probe surface is directly related to the distance from the steel substrate. By measuring flux density the coating thickness can be determined. Fig. 3. 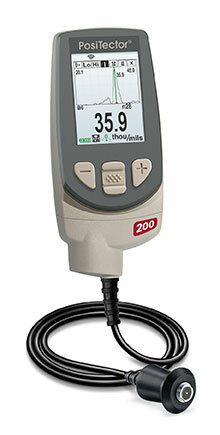 Electronic magnetic induction thickness gauges. Electronic magnetic gages (e.g. PosiTector 6000 F Series, PosiTest DFT Ferrous) come in many shapes and sizes. They commonly use a constant pressure probe to provide consistent readings that are not influenced by different operators. Readings are shown on a liquid crystal display (LCD). They can have options to store measurement results, perform instant analysis of readings, and output results to a printer or computer for further examination. Typical tolerance is ±1%. The manufacturer’s instructions should be carefully followed for most accurate results. Standard test methods are available in ASTM D 1186, D 7091-05, ISO 2178 and ISO 2808. Eddy current techniques are used to nondestructively measure the thickness of nonconductive coatings on nonferrous metal substrates. A coil of fine wire conducting a high-frequency alternating current (above 1 MHz) is used to set up an alternating magnetic field at the surface of the instrument's probe. When the probe is brought near a conductive surface, the alternating magnetic field will set up eddy currents on the surface. The substrate characteristics and the distance of the probe from the substrate (the coating thickness) affect the magnitude of the eddy currents. The eddy currents create their own opposing electromagnetic field that can be sensed by the exciting coil or by a second, adjacent coil. Eddy current coating thickness gages (e.g. PosiTector 6000 N Series) look and operate like electronic magnetic gages. 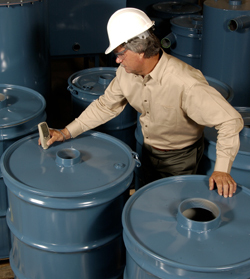 They are used to measure coating thickness over all nonferrous metals. Like magnetic electronic gages, they commonly use a constant pressure probe and display results on an LCD. They can also have options to store measurement results or perform instant analysis of readings and output to a printer or computer for further examination. The typical tolerance is ±1%. Testing is sensitive to surface roughness, curvature, substrate thickness, type of metal substrate and distance from an edge. Standard methods for the application and performance of this test are available in ASTM B 244, ASTM D 1400, D 7091-05 and ISO 2360. It is now common for gauges to incorporate both magnetic and eddy current principles into one unit (e.g. PosiTector 6000 FN, PosiTest DFT Combo). Some simplify the task of measuring most coatings over any metal by switching automatically from one principle of operation to the other, depending upon the substrate. These combination units are popular with painters and powder coaters. The ultrasonic pulse-echo technique of ultrasonic gages (e.g. 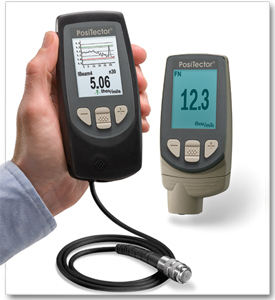 PosiTector 200) is used to measure the thickness of coatings on nonmetal substrates (plastic, wood, etc.) without damaging the coating. Fig. 4. Ultrasonic gauge can measure the thickness of coatings on nonmetallic substrates. The probe of the instrument contains an ultrasonic transducer that sends a pulse through the coating. The pulse reflects back from the substrate to the transducer and is converted into a high frequency electrical signal. The echo waveform is digitized and analyzed to determine coating thickness. In some circumstances, individual layers in a multi-layer system can be measured. Typical tolerance for this device is ±3%. Standard methods for the application and performance of this test are available in ASTM D 6132. Micrometers are sometimes used to check coating thickness. They have the advantage of measuring any coating/substrate combination but the disadvantage of requiring access to the bare substrate. The requirement to touch both the surface of the coating and the underside of the substrate can be limiting and they are often not sensitive enough to measure thin coatings. Two measurements must be taken: one with the coating in place and the other without. The difference between the two readings, the height variation, is taken to be the coating thickness. On rough surfaces, micrometers measure coating thickness above the highest peak. One destructive technique is to cut the coated part in a cross section and measure the film thickness by viewing the cut microscopically. Another cross sectioning technique uses a scaled microscope to view a geometric incision through the dry-film coating. A special cutting tool is used to make a small, precise V-groove through the coating and into the substrate. Gages are available that come complete with cutting tips and illuminated scaled magnifier. While the principles of this destructive method are easy to understand, there are opportunities for measuring error. It takes skill to prepare the sample and interpret the results. Adjusting the measurement reticule to a jagged or indistinct interface may create inaccuracy, particularly between different operators. This method is used when inexpensive, nondestructive methods are not possible, or as a way of confirming nondestructive results. ASTM D 4138 outlines a standard method for this measurement system. where T is the thickness in micrometers, m is the mass of the coating in milligrams, A is the area tested in square centimeters, and d is the density in grams per cubic centimeter. It is difficult to relate the mass of the coating to thickness when the substrate is rough or the coating uneven. Laboratories are best equipped to handle this time-consuming and often destructive method. Wet-film thickness gauges help determine how much material to apply wet to achieve a specified dry-film thickness provided that the percent of solids by volume is known. They measure all types of wet organic coatings, such as paint, varnish, and lacquer on flat or curved smooth surfaces. Measuring wet film thickness during application identifies the need for immediate correction and adjustment by the applicator. Correction of the film after it has dried or chemically cured requires costly extra labor time, may lead to contamination of the film, and may introduce problems of adhesion and integrity of the coating system. Wet-film is most often measured with a wet film comb or wheel. The wet-film comb is a flat aluminum, plastic, or stainless steel plate with calibrated notches on the edge of each face. The gage is placed squarely and firmly onto the surface to be measured immediately after coating application and then removed. The wet-film thickness lies between the highest coated notch and the next uncoated notch. Notched gage measurements are neither accurate nor sensitive, but they are useful in determining approximate wet-film thickness of coatings on articles where size and shape prohibit the use of more precise methods. (ASTM D1212). The gage should be used on smooth surfaces, free from irregularities and should be used along the length, not the width, of curved surfaces. Using a wet-film gage on quick-drying coatings will yield inaccurate measurements. ASTM D4414 outlines a standard method for measurement of wet-film thickness by notch gages. A wet film wheel (eccentric roller) uses three disks. The gage is rolled in the wet film until the center disk touches the wet film. The point where it makes contact provides the wet film thickness.Powder coatings can be measured prior to curing with a simple hand-held comb or an ultrasonic gage. The uncured powder film comb works much the same way as wet film gage. The comb is dragged through the powder film and the thickness lies between the highest numbered tooth which made a mark and has powder clinging to it, and the next highest tooth which left no mark and has no powder clinging to it. These gages are relatively inexpensive with accuracy of ±5mm. They are only suitable as a guide since the cured film may be different after flow. Marks left by the gage may affect the characteristics of the cured film. An ultrasonic device can be used non-destructively on uncured powder on smooth metallic surfaces to predict the thickness of the cured film. The probe is positioned a short distance from the surface to be measured and a reading is displayed on the LCD of the device. Measurement uncertainty is ±5mm. Coating thickness gages are calibrated to known thickness standards. There are many sources of thickness standards but it is best to ensure they are traceable to a national measurement institute such as NIST (National Institute of Standards & Technology). It is also important to verify the standards are at least four times as accurate as the gage they will be used to calibrate. A regular check against these standards verifies the gage is operating properly. When readings do not meet the accuracy specification of the gage, the gage must be adjusted or repaired and then calibrated again. Film thickness in coatings can have a big impact on cost and quality. Measurement of film thickness should be a routine event for all coaters. The correct gage to use depends on the thickness range of the coating, the shape and type of substrate, the cost of the gage, and how critical it is to get an accurate measurement. DAVID BEAMISH is President of DeFelsko Corporation, a New York-based manufacturer of hand-held coating test instruments sold worldwide. He has a degree in Civil Engineering and has more than 25 years of experience in the design, manufacture, and marketing of these testing instruments in a variety of international industries including industrial painting, quality inspection, and manufacturing. He conducts training seminars and is an active member of various organizations including NACE, SSPC, ASTM and ISO.